It was all love for Meghan Markle on her birthday...at least on one side of the pond. 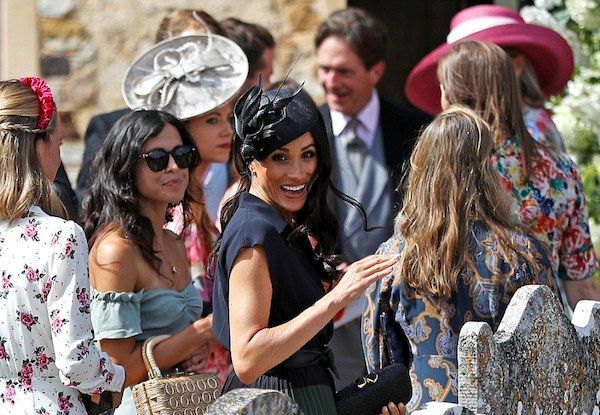 The Duchess of Sussex celebrated her 37th birthday yesterday, totally surrounded by love as she and her husband Prince Harry attended a wedding together. 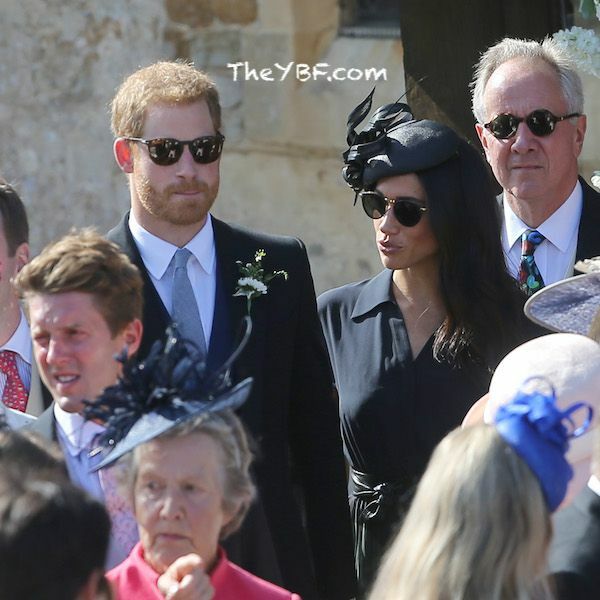 The couple stepped out to attend a wedding ceremony for one of Harry's oldest family friends, Charlie va Straubenzee, who married his girlfriend Daisy Jenks inside St Mary the Virgin Church in Surrey, England on Saturday (August 4th). It's her first birthday as an official royal. After the Duke and Duchess of Sussez arrive at the church separately, the newlyweds were spotted holding hands as they made their way inside the church for the wedding festivities. Despite reports, Harry did not serve as a groomsman, however he did participate in the usher duties. 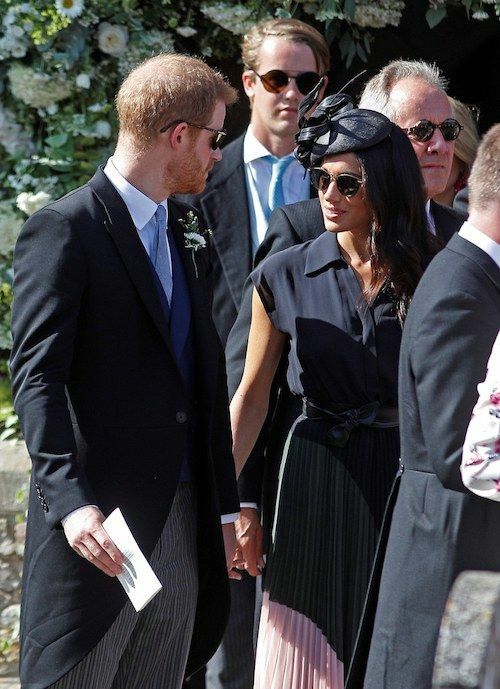 The Duchess wore a black, white, pink and olive color-block pleated Club Monaco dress styled with black Aquazzura pumps, a Kayu clutch and a black Philp Treacy fascinator to top it off. First, she called Meghan out for not telling their father, Thomas Markle, Happy Birthday last month. "Happy Birthday Meg! It would be so lovely and appropriate of you to send DAD a BELATED birthday card for his July 18th [cake emoji] @KensingtonRoyal Cheers!" Samantha tweeted from a private account on Friday. That's not all. 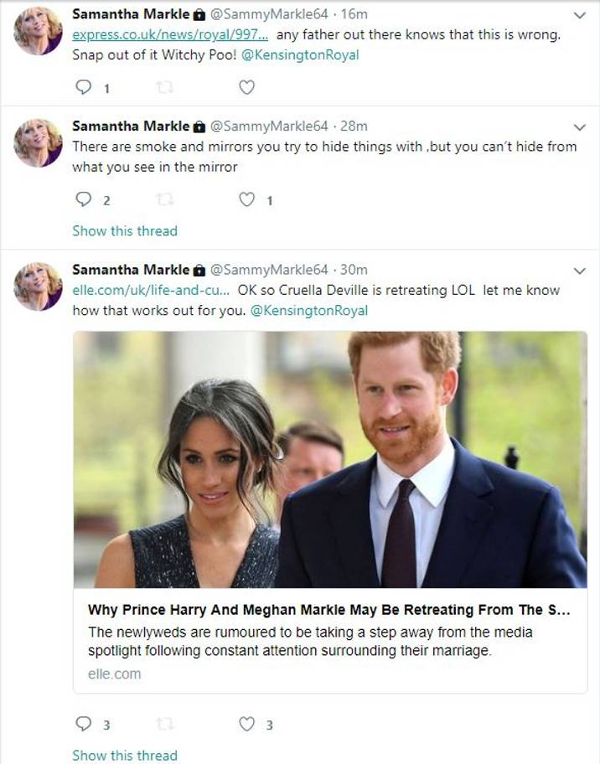 Samantha shared an Elle article that said there were rumors that Meghan and Harry were "stepping away from the media spotlight," in which she added a caption comparing her sister to Cruella de Vil. In another tweet (screenshot by The Evening Standard), she nicknamed her sister "witchy poo." Does this woman not have anything better to do? Speaking of Meghan's dad, there are rumors circulating that she may be planning a visit to reunite with her dad in an effort to "heal their rift." She aims to meet Thomas, 74, on a solo visit to America later this month to try to heal their rift, a source revealed. Meghan is said to be poised to complete the secret showdown in the US in three weeks. A source claims Thomas, 74 – who pulled out of the Royal Wedding on health grounds two months ago – is understood to be “keeping two dates free at the end of the month” to meet his daughter. 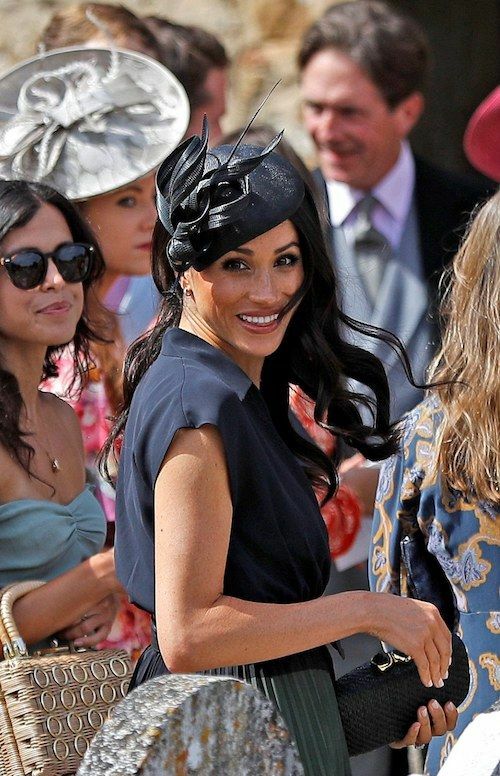 Friends believe it could be the first move to end the heartbreaking family rift which has plagued the Duchess of Sussex since her big day in May.